My mom came into town today for a visit and that was enough to make me smile effortlessly, and that lingered on through our shopping. 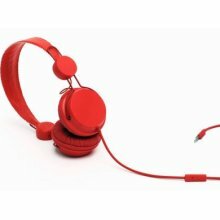 One of the things purchased today, were a pair of red, retro styled headphones for my daughter and we grabbed the last pair stocked in her favorite color. We bought the headphones and eventually made it out to the car to head home. My little girl, who was certainly ready for a peaceful ride home, asked to wear her new cool headphones. Unfortunately, I opened the box to find that one ear pad was missing! *Gasp! I would have to return them, but that meant that she would not be able to have the headphones in her favorite color and would have to settle for pink or even worse, white! What a world! But as I left the crew to settle down in the car with my mom, I popped back in to the store to make the exchange. I went to the table to grab a pink pair, but something else caught my eye... a red ear pad. Yes!! No need to exchange anything. She got the color she wanted after all and was glad she didn’t have to buy the pink pair, or worse, white! Ahh, I love when things fall into place like that! It was a long day and I’m exhausted... falling asleep as I type actually. But I’m looking forward to a trip to the zoo tomorrow and thrilled that my mom will be joining us this time. Can’t wait.... At least tomorrow, I’ll be waking up to my alarm and not an unwanted one. Hopefully, every thing will fall into place tomorrow as well! That would be extremely smile worthy! I love it when everything falls into place! It's what I call a perfect day! Tina, we were having a good time, a little hectic, but it was good time regardless!